Work Smarter. Unplug and Recharge. Get some sleep! These are just a few of the messages that Thrive Global is sending to the world. In today’s hectic, plugged in world, women especially multitask so much that something’s got to give. And it’s usually getting enough rest. With so many demands placed upon women executives and professionals in today’s workplace, it’s not surprising that women are burning out by age 30 at the same level as their male counterparts (Fortune Magazine, 3/16/16). While there is a lower rate of unemployment, there are still expectations that cause women to consider walking away. Women are expected to look good, be energetic, be professional, and be on top of their game every day. Then after the day’s work where they may have already put in overtime or missed lunch, most women still have to continue that same energy level at home for their spouse and/or family. Having so many demands placed upon them can create two different reactions. Some women are lucky enough to hit the bed and turn off their mind and get the proper night’s rest. They are able to get up bright eyed and bushy tailed to do it all over again. Others are not so lucky. When they hit the bed, their minds race with all the thoughts of unfinished business and chores. They are left restless and unable to get the sufficient amount of sleep in order to function properly. Waking up in the morning, dressing for success, and looking and feeling your best can create a positive outcome in ones work and home life. If you are waking up exhausted and emotionally stressed, the last thing you want to do is apply make-up, dress for success, and make breakfast for the kids. You may be on the verge of total burnout – with your job, with your familial responsibilities and all other aspects of your double shift life. Knowing how to manage your time properly and manage your thought process is an important key to getting proper rest. Sometimes saying “no” or delegating is okay. Most women are so worried about what other people think, especially when trying to rise to that next level in their careers, that they overextend themselves and burn out. This is something that should not be taken lightly. You need to stay positive. Take a break, finish on time, and development positive relationships both inside and outside of your company. Join an organization such as P.O.W.E.R. (Professional Organization of Women of Excellence Recognized) that wants to assist women in multiple areas of their lives by connecting them with like-minded professionals, helping them network and get business contacts, and by offering them services to help them get the added exposure and recognition they deserve. By taking control of your lives – your work and home lives – you can restore your equilibrium and connect with others in your situation. Networking has been a popular tool of executives for many years, and P.O.W.E.R. offers you this option joining you to other like minded women willing to share their solutions with you. While P.O.W.E.R. can’t sing you to sleep or make breakfast for your family, they can take some of the stress off your shoulders in your career life by giving you extra time to devote to other tasks. For more information on P.O.W.E.R. visit their site at http://www.powerwoe.com. 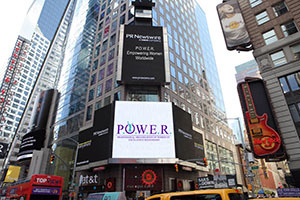 Located on Long Island, New York, P.O.W.E.R. reaches women throughout the world. It’s building a membership that will provide career opportunities, mentoring and networking in addition to the other services offered. Most importantly, P.O.W.E.R. members will find that excellence is achieved through empowerment.